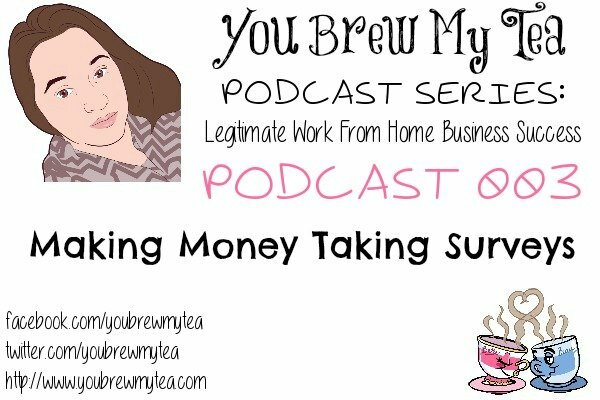 If you have been hanging around here much the last few weeks, you know we have recently started a series of podcasts covering all the ways you can make money from home. This week we are covering Making Money Taking Surveys. This is one of the most controversial subjects in working from home, because it isn’t always very profitable. Many people feel there are scams and potential for overwork with little pay. The facts are – surveys at home can be lucrative, but they can also be very time consuming. This podcast covers all of the basics on how to make the most of your surveys, all while understanding the limitations. Sit down, grab a notepad and a cup of coffee and listen in as I cover some of the common things you should know when giving this a try to supplement your income. Schedule to follow for rotating through all survey sites. Your demographics (age, race, location) are what get you surveys. Some surveys will pay only a few dollars each, others will pay large amounts. This varies widely and is to be expected. Changes happen regularly. Don’t depend on having that high paying survey each month. Don’t put all of your eggs in one basket. Make sure to sign up for multiple companies that give you multiple opportunities to earn. Keep notes about completed surveys, amount owed to you and when payment should be received. Follow up regularly as needed. Pinecone Research: This company offers tons of simple surveys with a regular flat rate payment of $3 per survey. They also routinely look for specific demographics to participate. Young people between 18-24, men and Hispanics are almost always in high demand. Vindale Research: This group has a wide range of surveys that pay out from $.35 for a short demographic panel, to $150 for a product review and survey. Some of their offers include making a product purchase then following up with them on a review after using. They are a reputable company to work with, and if you are consistent can pay out a nice amount of money each month. American Consumer Opinion: This site has been around for many years and is a standard in survey taking. They offer moderate to high pay per survey and are one of the highest ranking in satisfaction from companies using them as well as the individuals taking surveys with them. Opinion Outpost: This site can be a bit hit and miss, but with their $5 minimum payout level it can also be great for fast money if you are in need. Demographics are all over the place with their surveys, so just keep trying until you find something that works great for you. Quick Rewards: This site can be tough to navigate, but the no minimum payout portion makes it a favorite for many. Set up a separate email account just for them, as they will flood you with offers every day. Anywhere from 15-50 emails a day from them. Get to know their site and work toward your goal. Cash out at any time. Swagbucks: While this site and program offers a lot of surveys, they also offer a ton of other ways to earn money. Their surveys payout in what they call swagbucks – not cold hard cash. You then redeem those swagbucks for gift cards or products in their store. This is a great way to earn Paypal money, large electronics or Amazon gift cards. We earn $250-$300 a year in Amazon gift cards with casual use of this site. Inbox Dollars: Similar to Swagbucks with multiple ways to earn, their surveys tend to pay out a bit lower than others. They have a fee for cashing out, but it is minimal. This is a site that can be used on occasion for a little residual income at the end of the year. We earn $120-$180 a year from them with very casual use. Checking in 2-3 times a week and doing surveys or completing offers. All of this information is here to help you succeed in making your dream of working from home a reality. While this is not the work at home income most are looking for, we feel it is important to talk about making money taking surveys, as there are some people reading and listening who only have a few hours a day to work with. This is a great way for that stay at home mom to create a Christmas fund, or to even help fund their family vacation. Every little bit helps, and while you work to get your business off the ground, this may be just the thing for you too. Check out our past podcasts and don’t forget to sign up for our weekly newsletter so you don’t miss out on any new updates on the site!